A palm-​​size 15th-​​century book from Northeastern’s archives at Snell Library was selected to be part of the multi-​​venue exhibit “Beyond Words: Illu­mi­nated Man­u­scripts in Boston Col­lec­tions.” Described by its cura­tors as “the largest exhibit of pre-​​1600 man­u­scripts ever mounted in North America,” “Beyond Words” fea­tures more than 260 items span­ning the 9th to the 17th cen­turies donated by 19 Boston-​​area libraries and museums. 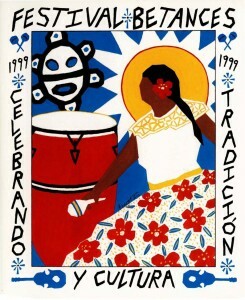 Announcing the Archives and Special Collections new portal to Boston’s latino/a history, http://latinohistory.library.northeastern.edu/! 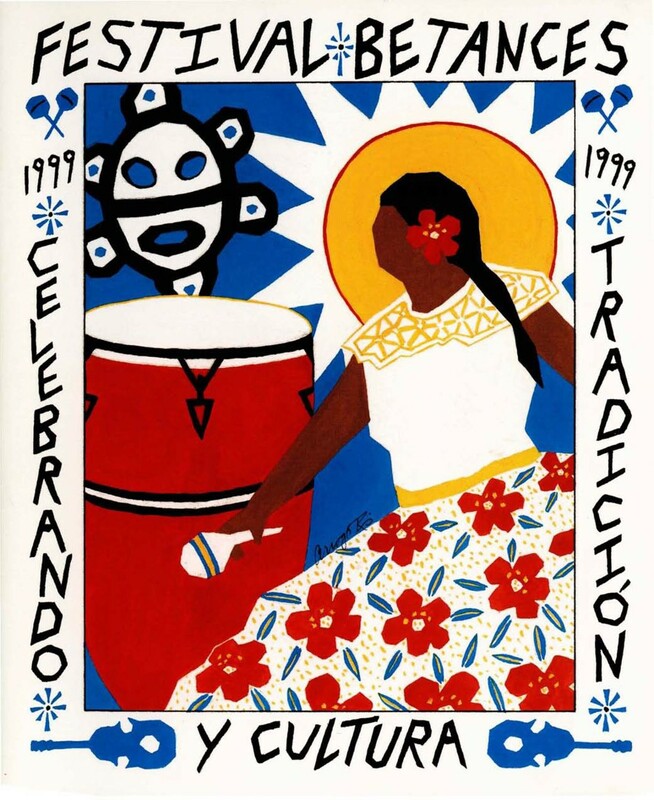 Boston’s Latino/a Community History Collection contains images, documents, and posters selected from the Inquilinos Boricuas en Acción records and the La Alianza Hispana records held in the Northeastern University Libraries, Archives and Special Collections Department. The documents scanned from the collection include organizational charts and histories, committee and taskforce meeting minutes, fact sheets, by-laws, articles of incorporation, annual reports, program descriptions and brochures, newsletters, and organizational reports. The records available in this online collection document public policy formation, community relations, affordable housing, urban planning and housing rehabilitation, cultural and educational programming, violence prevention, and minority rights during the last decades of the 20th century. The collection was originally scanned and made available in 2009 by a grant from the Institute of Museum and Library Services but has since been completely overhauled. Each item was given additional item-level metadata allowing users to dig deeper into the collection. The searching and browsing interfaces were rebuilt using the Library’s Digital Scholarship Group’s CERES: Exhibit Toolkit, giving users immediate and searchable access to the collection. CERES is a user-friendly platform with which faculty, staff, and student scholars at Northeastern University are building WordPress exhibits incorporating curated digital objects. In total, DRS files have accumulated 170,786 views, 165,997 downloads, and 2,326 audio or video streams. The most popular files are from the Profile of Nonverbal Sensitivity (PONS), which is a psychological test that measures a subject’s ability to interpret nonverbal cues. Collectively the PONS materials have been viewed 2,464 times, downloaded 2,099 times, and the videos have been streamed through the DRS 806 times. Archives and Special Collections’ Digital Collection has the largest number of files (53,407), as well as the highest total views (60,984) and downloads (47,604) for all files in a single community. Throughout the summer and fall of 2016, I am working with Northeastern University’s Archives and Special Collections and more specifically their portion of the materials that have been scanned for the Boston Public Schools Desegregation Project, creating EAC-CPF (Encoded Archival Context – Corporate Bodies, Persons, and Families) records. I am doing this work as part of an independent study for the Simmons College Library and Information Science master’s program, culminating more than two years of practical and intellectual study with this project, which is supervised by Katherine Wisser, Chair of the Society of American Archivists EAC Working Group. Coming into the program at Simmons, I had a master’s from New York University’s Institute of Fine Arts in art and architectural history and several years as a sports journalist, thus an interest in written analysis and description was long engrained. Discovering archival standards for description and encoding description only furthered this focus, and the relationship between entities (who might also be creators) and archival materials or records struck me from the moment I heard of it. In the ensuing years of coursework and as an early professional processing collections at the Phillips Library, Peabody Essex Museum, and at the Center for the History of Medicine, where I am presently a processing assistant, this interest only expanded. How do we think about the records we arrange and describe? How do we make the choices for describing them? And then, on the other hand, how do we describe the entities that are related to the record—but also might be related to one another? 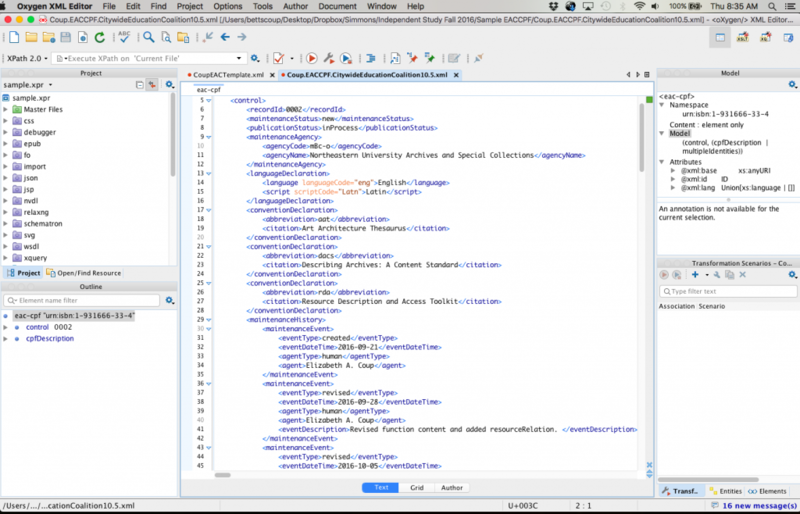 How does describing entities and relationships between them improve access to archival materials? It is these final questions that I am exploring with my ongoing project. 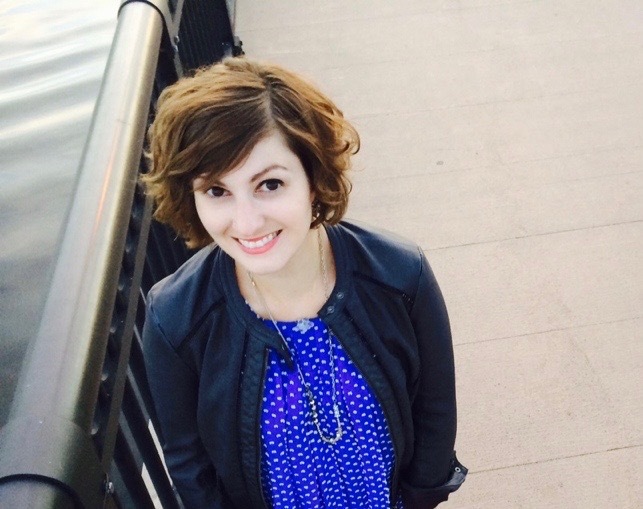 In fall 2015, I met with Giordana Mecagni, the Head of Northeastern University’s Archives and Special Collections, for a project that was part of my regular coursework in the Simmons College Library and Information Sciences master’s program. During our conversation, she told me about the Boston Public Schools Desegregation Project, which immediately struck me for multiple reasons, one of which was that it might be just the project for which encoded description specific to creators, rather than materials, might be extremely useful. 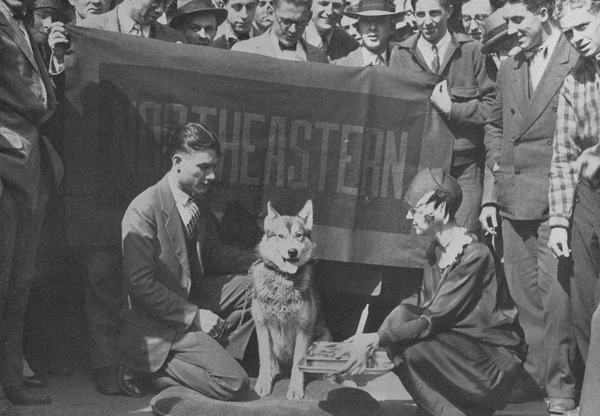 It is a significantly sized online collection not just from Northeastern’s archives, but also across multiple local and regional archives, and with a range of creators that spans from national and regional political figures to lesser known activists and neighborhood organizations. Thinking about describing the relationships between these creators—or entities—as well as providing users with access to additional description not of materials, but of entities, became the impetus for this project. The project began this past summer, when I began working with Giordana Mecagni, Michelle Romero, and Daniel Jergovic to create an EAC-CPF template that could be used not only for entities related to this project, but also for all entities related to Northeastern collections. Furthermore, I established a list of all primary entities associated with the BPS Desegregation Project materials at Northeastern, and then met with Giordana and Michelle to prioritize a group for which records would be created first. The ways to think about prioritizing came from two directions: the importance of the entities within the historical context of BPS Desegregation and relevance to Northeastern’s archival holdings. Considering these concepts, we came to a list of some thirty-two entities, which range from members of government and national social justice organizations to neighborhood groups and local activists, and I stepped into the biographical research portion of the project. 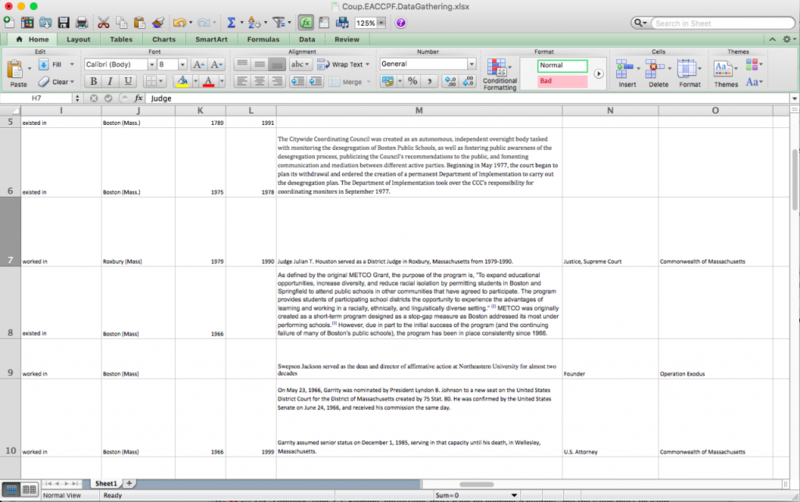 Screenshot of data gathering spreadsheet. 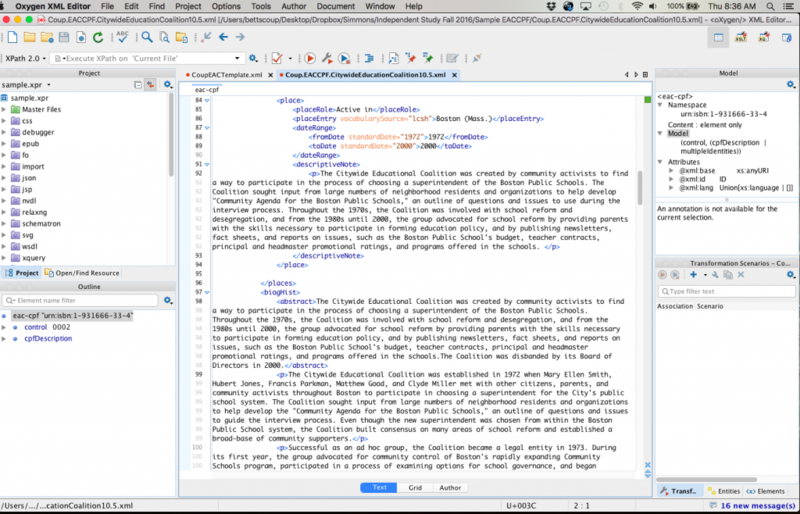 Simultaneously, we began the process of reviewing the EAC-CPF template I created, based on examples from other locations exploring the standard, such as “Connecting the Dots,” a Yale-Harvard collaboration relating to describing lexicographer Samuel Johnson and his circle, and those who collected their materials, as well as the Field Book Project at the Smithsonian Institute Archives. I also looked at the more open and flexible templates being created at present for institution-wide usage at Harvard Libraries, including the Center for the History of Medicine, which is in the process of creating a template and defining guidelines at the present. With these in mind, I created a sample entry, which has then been adapted and edited through email exchanges and meeting with Northeastern staff and Kathy Wisser. We hope to have that template solidified in the coming weeks, so that I can begin producing records for those priority entities. Perhaps the most challenging (and interesting) consideration throughout the research and template creation stages is the concept that EAC does not in fact describe archival materials, but the entities themselves. For these reasons, LCSH subject headings make less sense to describe the entities than, say, occupations authorities. When writing biographical or historical notes, the note is not exactly what one might create for a finding aid; it is not related to the materials in the collection but to the entities’ entire biography or history. What we as archivists write for finding aids might be just one chapter of what should appear in an EAC-CPF record. Still, the hope is that EAC records provide better access not just to the entity, but to archival materials, both created by this entity and by entities that might be related to this individual or corporate body, also described in EAC-CPF records. In a blogpost describing the Field Book Project at the Smithsonian, Tammy Peters wrote, “EAC-CPF helps outline an historical social network. Not only can a researcher find links to materials from that one person for whom they started their search, but they can also find resources concerning the organizations and people associated with that person.” Thus, though one is describing an entity—a person, corporate body, or family—one is doing so within the context of archival description. Screenshot one of Citywide Educational Coalition EAC-CPF record. Screenshot two of Citywide Educational Coalition EAC-CPF record. The challenge, of course, with using a new standard, is to make it work specifically for an institution and its needs, and to understand how best to do that. Within the project, I am working closely with Northeastern staff and Kathy Wisser to ensure that we not only create useful records that provide improved user access to archival materials, but also create best practice guidelines and a template which archivists, student workers and interns can all use going forward. Thus, the project is not just one that lasts a bit longer than a semester, but instead creates practice that will move into the future with Northeastern’s Archives and Special Collections. October is Open Access Month! In October the Library celebrates Open Access Month—a time to highlight the importance of making research and information more accessible without cost. Events throughout the month will showcase many ways in which people here at Northeastern and around the world are working to make Open Access a reality, including projects in which you can participate! Download a PDF schedule! Zotero in 30 Minutes Tuesday, October 4, 2:00-2:30 DSC Media Lounge Learn about using Zotero, one of the most well-known free, open source citation management tools, to organize your research. Track and gather all of your research in one place and automatically format citations and bibliographies—bring your laptop to get started right away. DH Open Office Hours Wednesday, October 5, 12:30-1:30 DSC Media Lounge Understanding copyright and fair use in the Digital Humanities will be the focus of this week’s regularly scheduled DH Open Office Hours. Citizen Science in Action with Zooniverse Thursday, October 6, 4:00-7:00 DSC Media Lounge Want to see how easy it is to contribute to citizen science research? 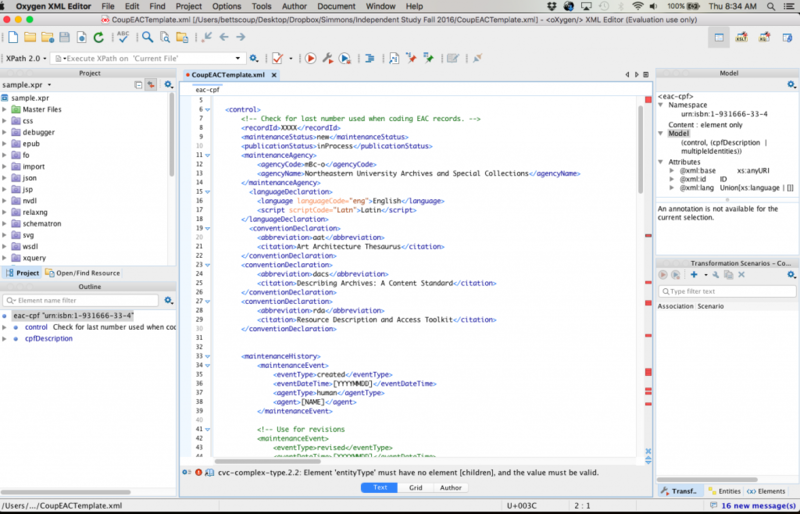 Drop in for a hack-a-thon style session and work with us on a Zooniverse project! No prior experience is necessary. We’ll provide guidance (and pizza! ), just bring a laptop or tablet to participate. More info available here! Refreshments will be served. Wikipedia Edit-a-thon Wednesday, October 12, 4:00-7:00 DSC Media Lounge Join us to improve Wikipedia’s coverage of under-represented groups in Massachusetts and U.S. history. This hack-a-thon style session will focus on editing and updating Wikipedia pages in a group setting. You do not need any prior experience with Wikipedia to participate. We’ll provide guidance, just bring a laptop or tablet to participate. Refreshments will be served. Managing Your Research Output for STEM Graduate Students Thursday, October 13, 11:00-12:00 422 SL Learn how and why to share your conference posters, presentation slides, codebase, and other products of your graduate research. Bring your questions about author rights, copyright, theses/dissertations, and anything else relevant to managing your output! We’ll provide info on resources available for you at the Library and elsewhere on campus. DSG/NULab Fall Welcome Event Monday, October 17, 3:00-6:30 90 SL Join the DSG and NULab at 3:00 for a keynote by Dan Cohen, Founding Executive Director of the Digital Public Library of America. This event will also feature lightning talks by Northeastern students, staff, and faculty about their recent work in digital scholarship, from 4:00-5:15. It will end with an informal reception where you can continue the conversation with area colleagues. Because space is limited, please register at bit.ly/DSGNULab2016 by October 10. Refreshments will be served. Decoding the Dragon Wednesday, October 19, 12:00-2:00 DSC Seminar Space Learn to read Northeastern University’s only medieval manuscript with faculty member Erika Boeckeler. Write Gothic letters with quills, tweet using medieval texting (aka abbreviationes), get a parchment souvenir and a Gothic henna tattoo. Level up through activities to become a “scribe” and contribute original research that will integrate into the manuscript’s website. We’ll provide guidance (and pizza! ), just bring a laptop or tablet to participate. Refreshments will be served. Sourcing Multimedia for Your Course Thursday, October 20, 10:30-12:00 140 SL The Internet offers a variety of public domain and Creative Commons images, movies, and documents that may be used to support teaching and learning. Learn strategies for finding relevant media and crediting the media appropriately. Hosted by Academic Technology Services Creating Interactive Open Educational Resources Friday, October 21, 1:00-3:00 140 SL This course will show you the basics of using Storyline to create interactive educational resources. You’ll learn how to incorporate open source multimedia, create your own text, audio, and image content, and create interactive features. Finally, we’ll discuss options for publishing on the web and posting to open educational resource aggregator sites. Hosted by Academic Technology Services Storing and Sharing Files Using the Digital Repository Service Monday, October 24, 2:00-3:00 DSC Media Lounge Did you know the library can help you preserve your project and research materials, while also making those materials accessible on the web? This session will introduce faculty, staff, and students to the Digital Repository Service, the library’s trusted resource for storing digital materials created or acquired by the Northeastern community. Data Management Plans and the DRS Tuesday, October 25, 12:30-1:30 DSC Media Lounge How can you effectively share and preserve research data while fulfilling grant requirements? This session will describe the library’s support for research data management, including the DMPTool as an option to generate data management plans, and the Digital Repository Service as an option for preserving and sharing research data. Refreshments will be served. Film Screening & Discussion: The Internet’s Own Boy Tuesday, October 25, 4:00-6:00 90 SL Join us for a screening of a special one-hour edit of this documentary about programmer and Internet activist Aaron Swartz. An audience-guided discussion will follow the film. Refreshments will be served. Archival Collections Transcribe-a-thon Wednesday, October 26, 4:00-7:00 DSC Media Lounge Digitized collections of manuscripts and ephemera need help from human eyes to be more useful to readers and researchers. We’ll highlight several major archives where anyone can participate in transcribing digitized materials online and get you started on some of these fascinating projects, which range from historical restaurant menus to explorers’ logbooks to anthropologists’ field notes. Drop in at any point during the session and bring a laptop or tablet to participate. More info available here! Refreshments will be served. Hypothes.is in 30 Minutes Friday, October 28, 11:00-11:30 DSC Media Lounge We’ll go over the basics of how to use this open-source annotation tool in your research and teaching! For more information and to sign up for an account in advance, visit hypothes.is.